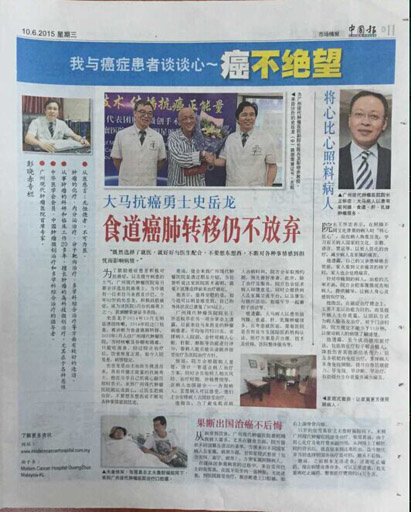 On August 12th, 2015, Guang Ming Daily published an article named “Cancer Patients should follow Doctors Advice to Take Individual Treatment instead of Blindness Single Treatment”, which aimed to help cancer patients better fight against cancer. 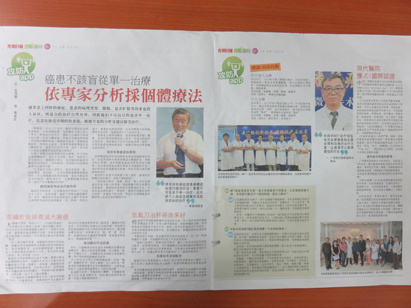 Li Xiaoshi, expert of Modern Cancer Hospital Guangzhou, introduced that the three major cancer treatments in early times are surgery resection, radiotherapy, and chemotherapy. However, surgery resection has the disadvantages of big trauma and high recurrence rate. Chemotherapy and radiotherapy are even worse; they cause great damage to normal cells, body immunity and hematopoietic function when killing cancer cells. Besides, radiotherapy and chemotherapy have lots of side effects, and it is easy for cancer cells to get drug resistance. With the development of medical technologies, anti-cancer technologies have been improved. Minimally invasive therapy is the most advanced technology right now; it is popular among cancer patients in that it has the advantages of small trauma, less side effects and good efficacy. However, doctor Li indicated that cancer patients should base on their condition and choose treatments that are suitable for them. For patients with same type of cancer, the treatment may also be different in that the pathological type, stage and diffusion of cancer vary from person to person. Therefore, patients should first take detailed examination, and then according to doctor’s analysis and suggestions, patient should take individual treatment instead of blindness single treatment. Take colorectal cancer for example, it can be treated with interventional therapy, multidisciplinary targeted joint-cell natural therapy, etc, which have better efficacy than single treatment. The primary treatment for liver cancer is traditional surgery resection, but it is not suitable for all the patients. Only those with good heart-lung function and no metastasis can take it. For other patients, they can take Ar-He knife which has less trauma and side effects. Ar-He knife kills tumor tissues precisely under the condition of alternating cold and hot, and eventually reach the effect which is similar to surgery resection. 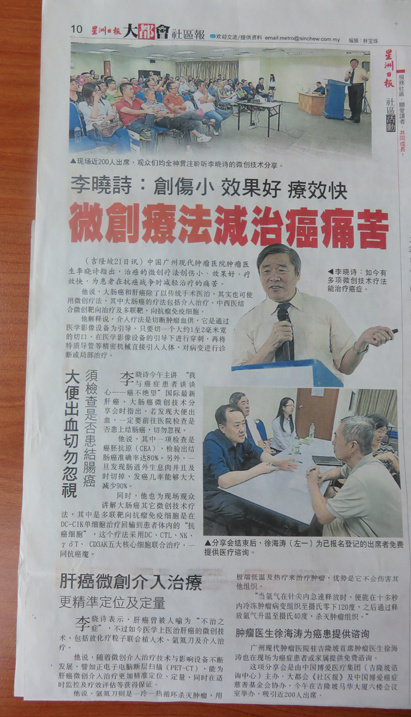 Moreover, doctor Li reminded people that prevention is important than treatment. People can prevent cancer through changing food dietary habit, like eating more high fiber foods can help reduce the morbidity of colorectal cancer. 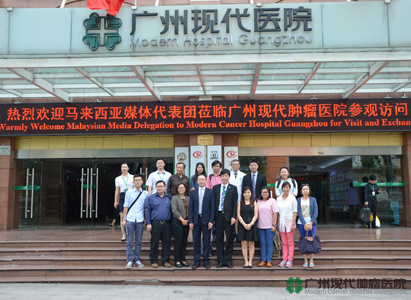 According to the report, Modern Cancer Hospital Guangzhou has 18 minimally invasive therapies, which have helped many patients fight against cancer. 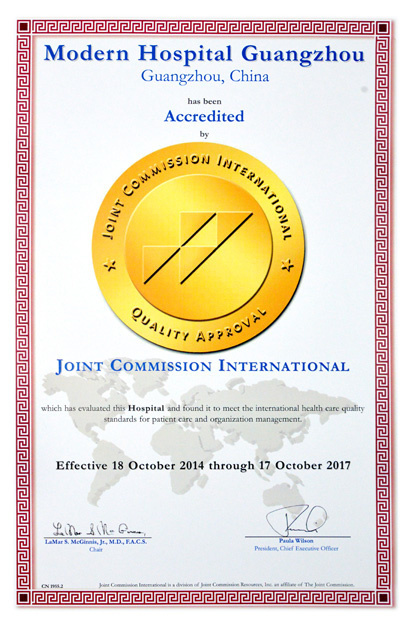 It is known that Modern Cancer Hospital Guangzhou has successfully accredited by the Joint Commission International (JCI), and its medical quality and management have reached the advanced international level.